Fresh doubts have arisen over plans by French Energy firm EDF to build an £18bn nuclear power plant at Hinkley Point, Somerset. Angus MacNeil, chairman of the House of Commons energy committee, has called for the project to be re-examined. It follows a letter that EDF chief executive Jean-Bernard Levy sent to his staff, saying the project needed more funding from the French government. The UK government said it was "committed" to Hinkley Point. But Mr MacNeil, an MP for the SNP, said the government needed to urgently rethink its support for the proposal. "It's something that has to be looked into very carefully and very soon because it is a huge obligation and a lot of eggs in quite small baskets," he said. "The Chinese are involved, the French involved, the UK are involved. They need to take a step back because other places have decided not to go ahead with this stuff." In his letter to EDF staff, Mr Levy said: "We are currently negotiating with the French state to obtain commitments allowing us to secure our financial position. "I am sure that this project is a good project for the group and that in the near future, all the conditions will come together for it to be definitely launched. "It is clear that I will not engage EDF in this project before these conditions are met." The company, which is 85% owned by the French government and owns 58 reactors in France, is expected to finalise in April how it will fund the project. It has postponed the decision a number of times. The plan was delayed in January, reportedly owing to funding difficulties. But Mr Levy highlighted in his letter that China General Nuclear Power Corporation (CGN), which will own 33.5% of the project, was investing about 8bn euros (£6bn). He also expressed his confidence in EDF to manage "very large projects". 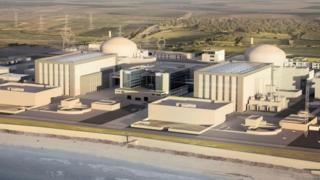 Pressure is mounting as the £18bn cost of the Hinkley project is more than the entire value of the firm. And there is scepticism as the British government has agreed to pay more than twice the current wholesale price of energy once the plant is producing - £92.50 per megawatt hour for electricity, against £37 per megawatt hour. But Prime Minister David Cameron has backed the plan, calling Hinkley Point a "pillar of (the UK and France's) bilateral relationship". Simon Taylor, an economist at Cambridge University, said the letter from Mr Levy showed he was looking for reassurances from the other stakeholders. He said it would be "very embarrassing for the French government to cancel this" but a pull-out from the UK side could also "cast doubt on the UK's entire energy policy" and jeopardise future projects. Imagine British Gas owners Centrica were in financial trouble after sinking billions into a French power station. And then imagine that the bill for rescuing it fell on to taxpayers. That is essentially the risk facing EDF and the French government. The dangers to the company's financial integrity are great enough to prompt EDF's chief financial officer to resign in protest, the French equivalent of the National Audit Office to issue stark warnings and French unions to lobby their members to vote against the project. To make matters worse, EDF's recent track record in delivering big projects is poor. Reactor construction in France and China have run over time and massively over budget. The prize for EDF with Hinkley Point is a guarantee to provide electricity for decades at three times the current price. The deal is still on but the stakes are high as a crucial EDF board meeting later this month approaches. Construction of Hinkley Point C in Somerset, the first new nuclear plant in the UK for 20 years and the most expensive in the world, is due to begin in 2019, two years after it had originally been due to open. Tom Greatrex, chief executive Nuclear Industry Association - which represents operators of nuclear power - said: "The UK needs new low carbon, baseload power to replace older power stations that have closed, or are about to close. "To improve energy security, reduce emissions and have a balanced energy mix for the future, we need Hinkley and other new nuclear power stations to go ahead." But Allan Jeffrey from the Stop Hinkley campaign group said there were many problems, whether construction, technical or financial. "Nuclear power is an old fashioned form of energy where you throw away most of your energy, it's dangerous and risky and open to terrorist attacks," he said. "We should be looking at Plan B which should be getting on with sustainable, renewable energy." The concerns are the latest in a string of problems - last week EDF's finance director Thomas Piquemal quit reportedly because he feared the project could jeopardise the company's financial position. And in February, Chris Bakken, the director of the project, said he was leaving to pursue other opportunities. Development has also been hindered by problems with a reactor. European Pressurised Reactors (EPRs), in use in Flamanville, France, were found to have a construction fault meaning they were unable to handle the required pressure. This pushed the plant's delivery date back while safety concerns were addressed. A Department of Energy and Climate Change spokesman said: "The British government is committed to Hinkley and committed to new nuclear. "It is the only proven low-carbon technology that can provide continuous power, irrespective of whether the wind is blowing and the sun is shining. "The industry will create thousands of jobs and benefit companies in the supply chain." Why does the UK need China to build its nuclear plants?